The tallest building in Miami is the 70-story Four Seasons Hotel Miami, which rises 789 feet (240 m) in the city's Brickell district and was completed in 2003. It also stands as the tallest building in the state of Florida and the 47th-tallest building in the United States. The second-tallest skyscraper in the city is the Wachovia Financial Center, which rises 764 feet (233 m). 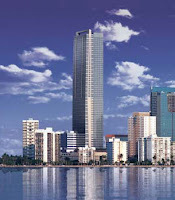 Nine of the ten tallest buildings in Florida are located in Miami.